Standard link list has its own “List view web part” which just show link from its site list in a column. 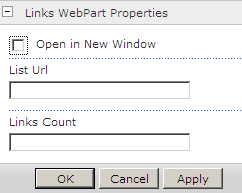 This webpart show links for any link list within site collection. One good part of this webpart is to show a thumbnail of the website and also can chose to open in new tab.